In this article, you’re going to learn how you can master your beats inside the box using nothing but free plugins. The results are pretty darn close. But there’s a little bit of a caveat here. Over the years, I’ve developed my mastering strategy to reflect that of mastering engineers working in very expensive mastering studios. Of course, I don’t have all the same equipment. But I’ve been setting myself up so that all of my mixing stays inside the box and all of my “mastering” is done on analog gear. A lot of pro mixers are mixing 100% in the box, but then their work gets sent to a mastering guy who's using heaps of analog gear. So if you don’t have an analog chain, don’t stress about it. Like I said, I’m going to show you my analog chain and then show you how to replicate it ITB to sound pretty close. Before I talk about the process, we need to go over something that’s very critical to how loud and proud your beats are going to sound. I’m talking sound selection and arrangement. If you aren’t aware of how important this is, don’t panic! We all start somewhere, and there was a time when I didn’t understand this myself. I’d be hacking away at my tracks adding unnecessary amounts of EQ, Compression and Limiting to the point of killing the entire track. But the moral of the story here is that you need to get everything to sound as good as possible from the start. This will result in less work for you during the mixing and the mastering stage. And all of this can be done with the arrangement, sound selection and even recording everything yourself (if that’s an option). If your arrangement is very low on the music scale, it’s going to be a lot harder to get the track to sound loud because you are moving farther away from the optimum range of hearing. Humans see a dip around 2-5kHz on the Fletcher-Munson curves, which means that we are most sensitive to that frequency range - any sound in that frequency range is going to sound loud to us. So if your entire beat is produced low enough that most of the instrumentation is below that region, then good luck on making it loud! But before you get excited and start boosting everything in that 2-5kHz region, remember that we are most sensitive to it. You stand a better chance of ruining the track than helping it by boosting every sound in that region. It’s best to produce and arrange your tracks with this region in mind. Another critical component to louder mastering is going to come from the samples you use. You need to arm yourself with sounds that not only thump in the low end but also cut through the mid range. A lot of new producers want big fat kick drums, but they never pay attention to how focused the midrange is in the samples. So when they play their tracks on car stereos or other sound systems, they commonly say how it sounds “boomy,” “dull”, and “quieter” than the pros. NEWS FLASH - You need more mid range! Remember the optimum frequency range I just told you about? You need some more of that in your samples. Sometimes EQ can help get the drums to cut, but if all your samples are dull and are focused mostly on the low end, EQ just isn’t going to be enough. That's why I created Modern Samples, to help producers like yourself get past that problem, so you can focus on creating - which is the most important thing. We’re living in a time where plugins are so good and so affordable that’s it’s almost scary. But seriously, it’s REALLY cool! The problem with that, though, is that it’s like a license to butcher your track. My one big of advice here is to try and make your productions using the least amount of plugins that you possibly can. Focus on the blends and vibe. Then if you need to, bring in a plugin to make some tweaks. At the very least, try it out and see what happens. Okay, so why did I tell you all of that mumbo jumbo before getting into the good stuff? The biggest reason is that if I don’t, I feel like I would be doing you a disservice. You’d walk away, try the technique, realize it’s not working for you, curse me out and then never want to listen to anything I say again. Ultimately you need some foundational principles to build from. If you can master the stuff I talked about above, you are going to be killing it, and the mastering is going to come so quickly to you. Before I talk about the 3 different techniques, let's first talk about the goals that I am trying to achieve from the gear. This will help you understand why I'm doing what I'm doing and should help you replicate a similar process with plugins. Make the beat brighter. The BAX to give me a clean/professional sounding Mid Range and Top End. Cutthe extreme highs and extreme lows to get more headroom (this means I can get the beat louder). Use the API preamps & convertors for color, distortion, and compression. Okay, now let’s talk about my chain, and what I used in the production example you see in the video at the start of the article. 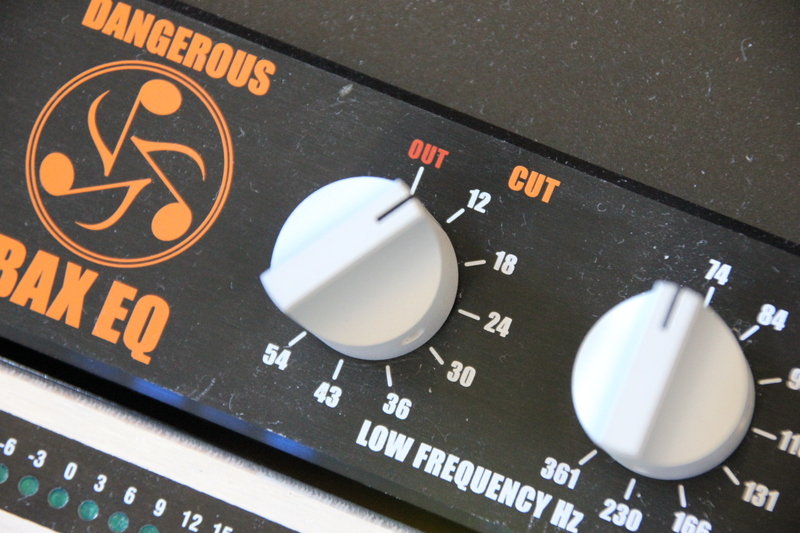 The first piece of gear in my analog chain is the Dangerous BAX EQ. This EQ is the perfect companion to a mastering engineer because the shelf filters maintain their phase coherence and do not change the characteristics of the original sound. You’re hearing a better version of the original sound. So if you produce your beats using everything that I talk about from above, your track should already sound punchy and focused in the mid range. Adding the BAX is only going to enhance and embellish what’s there, and that’s exactly what I want. It’s not impossible to achieve this ITB with a linear phase EQ, but there is something special that the BAX adds to the sound. I’ve yet to find anything that sounds the same. The first thing I did with the BAX EQ was set up a low-end filter to cut out the EXTREME low bass frequencies. When done correctly, this should be relatively undetectable to the ear but will do quite a bit for adding headroom to the mix. More headroom = louder mixes. For this particular track, I didn’t utilize the low-end shelf in on the BAX because I didn’t think it needed it. But it’s a great weapon to have in your arsenal. It can not only give you extra girth when you need it, but it also adds depth to the low end, unlike anything I’ve heard. With the high-end shelf, I’m boosting 3 dB’s at 3.4 kHz, which might seem like a lot, but I’m not doing much boosting to the individual instruments. I find that my mixes sound much more “professional” when I can do as much of the high end boosting towards the end of the mix. The last filter in the chain is the low pass which is set to 28 kHz and is getting rid of the extreme top end and any artifacts that might be messing with the head room. After I was happy with what I was getting from the BAX EQ, I ran the mix into the preamp section of the API A2D. Because of the color and tone that I get from the OP AMPS - they not only give me color but the round off the peaks ever so slightly in a very musical way. Almost acting as a compressor/limiter. The other thing that the A2D offers is the high-quality converter section, which could arguably be more important than the actual preamps themselves. The first part of the unit is the preamps, where I drove the mix through both A & B channels. I’m pushing the unit as hard as it will let me before it starts to distort and sound crunchy. At that Point, I will back off the throttle a bit so that I have the aggression but not the distortion. From there, I also pushed the digital section of the API because when you clip the converters, you get a “sound” from the unit that’s pleasing to the ear. Now that you know exactly what I was doing with the hardware, I’m going to show you how I mimic that ITB. Though it’s not going to sound exactly like the hardware version, it comes pretty close. Also keep in mind that I’m using the tools that I have available to me. If I had different plugins, I might be able to get even closer to my hardware. Remember: The concept is much more important than the actual plugins. In the world of analog, one wouldn’t compare the BAX EQ and a Neve 1073 - even as distant cousins - because they both have such a different sound. But when I was trying to mimic my analog setup, the Scheps gave me a tone that I wanted to hear. Thus I stuck with it. The high-end shelf has a starting point of 12 kHz, and I’m boosting it up by 1.5 dBs. For the mid-range band, I set the frequency point to 4.8 kHz and boosted up 1.9 dBs. It’s important to remember that my goal is to highlight the midrange and top end so that I’m shining a light on that frequency range. It’s not necessary to be aggressive at this stage - too much boosting and you will inevitably kill the mix. In this example, I’m using the Mix Buss version of the Slate VCC. I have the plugin set to US A, which is their version of the API console. As a bonus, you can also try out the other consoles to see what kind of sounds and textures you get. I stuck with the API because I wanted to mimic my analog chain and I felt like the US A setting was the closest. The next thing I did was set the drive to +18 because it’s going to give me the biggest bang-for-buck when I start to push the input gain. When I push the analog preamps, they are not forgiving if I push them too far, and I want that same feeling when I drive this plugin. Now that I have all of that setup, the next step is to play the track and push the input gain of the VCC until I start to hear some noticeable distortion. Once it gets to the point of not sounding very good, I will back off the input until the distortion goes away. After the VCC is applied to the track, it removed a lot of the peaks in the production with little destruction to the sound. This then allowed me to bring the overall volume up with some added output gain. A collection of high quality, professionally recorded and processed hip hop drum sounds. In the spirit of trying to show you what you can accomplish with the little that you have, I decided to create a third option using FREE plugins. By most standards, this would be the lesser quality of the three but to be honest, I was even surprised myself at how close I got the sound to the Analog version. With the avid EQ, I’m probably mimicking the BAX setup more than I was with the Scheps in the previous example. The first thing I’m doing is rolling out the extreme low end at 26.2 Hz using a high pass filter. Then using the high-mid frequency band, I’m boosting 2.8 dB at 2.25 kHz with a relatively wide band. Finally, the High shelf is set to 3.85 kHz, and I’m boosting 3.2 dBs. This plugin is super simple in the features and what you can do with it, and I’m barely using much. I have the distortion knob set to 1, which seems low, but it’s actually doing a lot of work. I find with this plugin that around 0.8 - 1.0, it starts to shave off the peaks and add a little something special. So as you can see, you have three different paths that ultimately lead to the same goal. Even though the outcome is slightly different, because I know what I’m looking for and listening for, it’s a lot easier to get the sound I want. It just goes to show you that if you arm yourself with some knowledge, you can quickly achieve professional results. I don’t think I will be giving up my analog chain anytime soon, but I can tell you that if I had no other option, I would be more than happy to use plugins on the final print. If you want to hear the demos of all three of these setups, make sure you watch the video attach to this article.